Hello, friends! I had a great weekend with the Smocking Arts Guild in Orlando. What a wonderful group of women! They are passionate about all sorts of needle arts, and if you have any interest at all in hand stitching they would be absolutely delighted if you would join their organization. They’re especially looking for younger members, and they are very generous with their time. They love to answer questions and to teach all sorts of needle arts, not just smocking. One of their members generously taught me to smock a baby gown, and it was quick and easy! 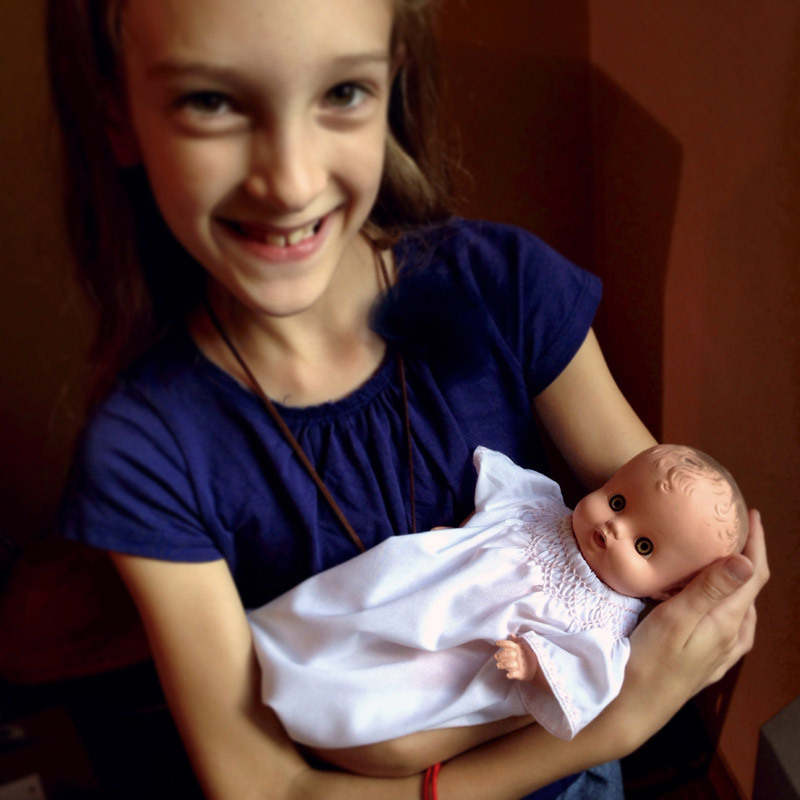 Here’s S, modeling it with her baby doll before I send it off to SAGA’s Wee Care, which donates smocked gowns to premature babies. While I was lecturing at the conference I shared a lot of photos of your work, and the members absolutely loved to see what all of your creativity. I showed off some of your Halloween costumes as well as a wide variety of your Roller Skate and Fairy Tale dresses. You are quite an impressive group of sewists! Emily and Ashley from Frances Suzanne made the trip, and it was great to finally meet them in person. I also met bloggers Teresa and Harmony. If I had remembered to take photos of the guild members’ work on display, you could see some stunning examples of pulled thread, hemstitching, ribbon embroidery, and dressmaking at its finest. It was really impressive. So if you have any interest learning new skills or developing some existing interests and skills, I’d encourage you to check out SAGA. The Smocking Arts Guild has chapters all over the place (Australia, you too! ), and you can become a member-at-large even if there aren’t any chapters near you. Or start your own; you only need three people to do so. It’s been a long time since I shared links with you. Here are a few to keep you busy until our next Liesl + Co pattern release on Thursday. Are you looking forward to it? I am! The most recent issue of The New Yorker features a fascinating article about full-ﬁgured fashion as it tries to find acceptance in the world of high fashion. It’s worth a read. If you get a chance to see it, the Dance and Fashion exhibit at the Museum at FIT is a wonderful show. Have I ever told you that I studied ballet all the way through high school? I would have loved to have been a professional dancer. 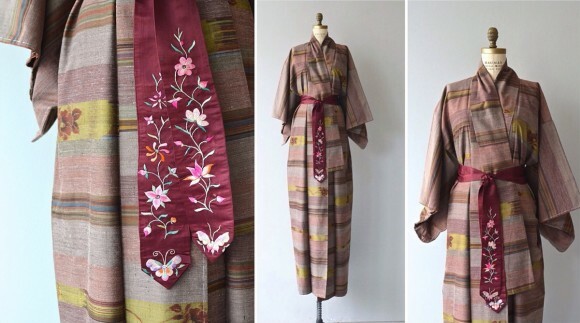 Isn’t this vintage kimono beautiful? I bought it with the idea that I’d wear it as a three-quarter-length jacket. But I had forgotten that kimonos are always very long and are folded to the proper length when the obi is tied. Now I’m debating whether to shorten it. It somehow feels wrong. What do you think? I started reading the book Women in Clothes on my trip and highly recommend it. I’m savoring it slowly, and it occurred to me that it might be fun for us to discuss some of the survey questions from the book on Facebook. I’ll post a question every now and then and encourage you to join in the discussion. It will be a fun way to get to know each other better and to participate in our own conversation about clothes and how we express ourselves through our appearance. Thank you for sharing all the interesting activities you’ve been involved in, L. What fun to catch up with those amazing sister sewists, F + S. Lucky you. Beautiful pic of S with her doll! What a weekend!!! Thank you, thank you, thank you for such a FUN WEEKEND!! We are still replaying all the festivities…and will continue to do so for many, many months to come…. The Smocking Arts Guild of America was honored to host Liesl. Her classes were a huge hit with our ladies and they can’t wait to have her come back and teach some more. Please come join us if you would like to learn more about smocking, embroidery, fine machine and hand sewing!